Last week was the confirmation hearing for General Eikenberry, the Obama Administration’s nominee for the next US Ambassador to Kabul, Afghanistan. Senator Lugar asked the nominee, “How competent will be police ever become?” He wondered — after all is said and done, what will be the judgment of the Afghan people when this is all over. And how diplomatically can all this be put together — will this work out? Will the plans we have be acceptable to the Afghans as opposed to being resisted by them? Why would we be more successful with more troops coming in now than we have been in the past? General Eikenberry’s response — “every poll shows that over 90% of the Afghan people firmly reject the Taliban – reject the dark Taliban primitive ideology.” Jeff Stein of CQ has a post on that 90% poll number. General Eikenberry cited a few things that must be done in Afghanistan — to change things in parts of Afghanistan where the Taliban is strong— also more security (not just how many troops, but what are they doing), the need to help and increase the rule of law and the need to think through very clearly the reconstruction program. He also mentioned the need to have more civilians out in the outer regions … You can see a video of the hearing here (1:43 min). His prepared testimony is here. 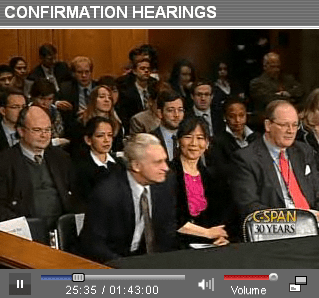 The nominee was accompanied to the hearing by his wife, Ching (who is going with him to Kabul, if he is confirmed; post is currently an unaccompanied assignment) and Ambassador Frank Ricciardone who is now, I supposed, officially the next DCM new Deputy Ambassador to Kabul (or just as soon as the general is confirmed). Reports called the use of the “deputy ambassador” title as unprecedented. True — you normally do not use that in the Foreign Service. The second ranking official in an embassy is called the Deputy Chief of Mission – but the use of “Deputy Ambassador” is not unprecedented. As far as I could tell, and now confirmed by the Historian’s Office — the title of ‘Deputy Ambassador’ had been previously used in Vietnam from 1964-1973. In fact, career diplomat, U. Alexis Johnson arrived at Saigon on June 28, 1964, as the first of a series of Deputy Ambassadors to Vietnam. So there … the question is — who decides if you get this title or not? Or how do you get this specific title from the bureaucracy if you feel like using ‘DA’ instead of ‘DCM’? It could not be the number of ambassadorships under your belt, because see – like Ambassador Ricciardone (Philippines and Egypt), the current DCM in Kabul, Christopher Dell is a career member of the Senior Foreign Service and had two prior ambassadorships (Zimbabwe and Angola). It could not be for importance of location – after all, wasn’t Iraq for a while, our most important foreign policy engagement? The most recent DCM there was Patricia Butenis (previously ambassador to Bangladesh) and her replacement reportedly is Robert S. Ford (previously ambassador to Algeria); neither of them had been introduced, as far as I know, as Deputy Ambassador to Iraq.